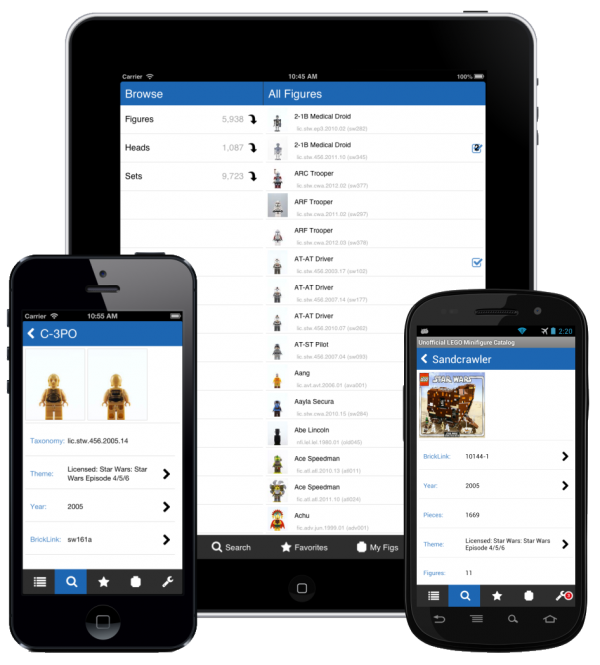 Over the past few weeks I’ve been working on a new version 2.0 of the Unofficial LEGO® Minifigure Catalog app. We’ve just released the version 2.0 to the Apple iTunes and Google Play App stores. Version 2.0 introduces tablet support along with a complete visual facelift. In addition, there are several performance improvements that make the app much faster when browsing, and I’ve added the ability to browse minifigures, sets and heads by name (in addition to by year and theme). Note: LEGO® is a trademark of the LEGO Group of companies which does not sponsor, authorize or endorse this app. First – Thank You for this very very fine app! I’ve used the previous version and was very impressed! Now supports the new version also Brickset – this is perfect! Works properly and with Galaxy S4 and Galaxy Note 10.1. Graphics are very nice, everything is clear. No crashes, all around very well done! THANK YOU!